Find your pot of gold with Illinois Gaming Systems $100,000 Clovers of Cash Giveaway launching Monday, February 11! 544 prizes are up for grabs with over $100,000 in cash prizes being awarded. Participants can enter the giveaway at any of the 238 IGS partner video gaming establishments via digital entry on a tablet kiosk. Enter to win daily! On February 25, all entries from the participating establishments will be combined to award 30 $1,000 cash prizes as part of the first round drawing. On March 25, as part of the second round drawings, one winner will be drawn to receive $10,000 cash, 37 winners will be drawn to receive $1,000 cash and 2 winners will be drawn at each participating establishment to receive $50 cash! Participants must be 21 or older to enter. No purchase is necessary. Something colossal is happening at IGS locations! 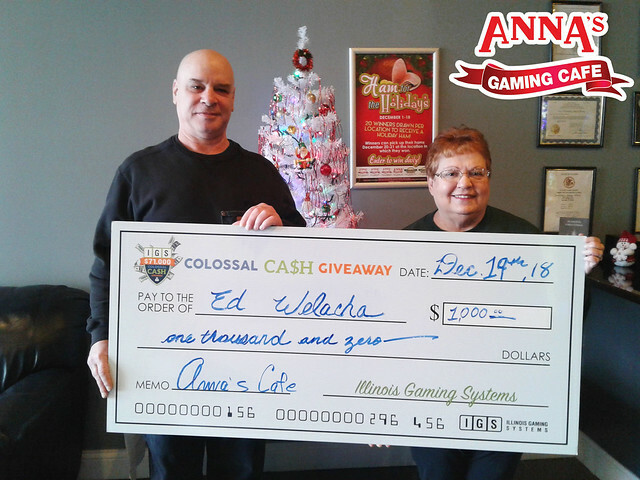 Starting November 12, IGS in partnership with 250 partner video gaming establishments state-wide, will be sponsoring the Colossal Cash Giveaway in which over $71,000 in cash prizes will be awarded. Participants can enter the giveaway once per day at any of the 250 participating establishments via a digital entry on a tablet kiosk November 12 through December 9, 2018. On November 30, each of the 250 establishments will draw three winners who will each be awarded a $50 cash prize. A total of 750 $50 cash prizes will be awarded. On December 10, all entries from the 250 establishments will be combined to award 25 grand prizes; one winner will receive $10,000 cash and 24 winners will each receive $1,000 cash prizes. “We are excited to offer our retail partners the opportunity to award 775 prizes to their patrons throughout the State! With more than $71,000 in cash prizes up for grabs, this is just the first of many sensational promotions to come from IGS,” said Kaitlin Zullo, IGS Marketing Manager. Currently, sports betting is a hot topic both in the legislature and State-wide. To date, Illinois has not passed legislation to allow sports betting in the state. This is a topic with a lot of interest and as such we expect to see legislation introduced shortly after the election and possibly taken up in the November Veto session. IGS, directly and in affiliation with the IGMOA and the IRA, are advocating that if the State allows sports betting that our segment of the industry should have an opportunity to participate. The economics of sports betting is not yet clear. Until we know what tax rate the State places on sports betting and the regulations will be required, it is simply premature to estimate just how lucrative this will be for your establishment. However, an important point to note about sports betting is that the revenue projections are not nearly the same as what VGT machines provide; it’s a very low margin business. We will keep you closely informed as things crystallize as we know many of our retailers are interested in what type of opportunity this may present. IGS Attended Illinois Restaurant Association’s 2018 Golf Classic! IGS attended the Illinois Restaurant Association’s 2018 Golf Classic at St. Andrews Golf & Country Club on August 1. It was a beautiful day for golf other than a little afternoon rain. We had a foursome participating on the green and had our marketing team running a Plinko game on Hole 5 with golfers to win fun prizes! With the theme being Mad Hatter’s Tee Party, we caught a glimpse of some great hats and outfits! IGS was a corporate sponsor of this great event and is a proud platinum sponsor for the Illinois Restaurant Association. We are already looking forward to next year’s outing and will be practicing our golf swings to ensure we keep our longest drive streak going for the third consecutive year! According to Facebook.com, there are 2 billion active users on the application each month. Just by having a page, you can reach current customers as well as a new customer-base of individuals potentially interested in your business. Generating Facebook content is a simple and FREE way to frequently communicate with those who follow your page. The best part is the IGS marketing team assists establishments with page creation, page management and content generation. Our designers create custom graphics that advertise your gaming room, specials, promotions or other updates you might want to share with your followers. Additionally, we can help manage your page by scheduling posts days, weeks or even months in advance saving you some time and effort involved in page management. Grow your audience for your business page by running sponsored ads. A sponsored ad amplifies your message to an audience targeted based on age, gender, location, interests and other demographics. Running sponsored ads or boosting posts are great ways to build gaming awareness, increase page likes and get users engaged in the content you share. Please reach out to your account manager if you are an existing client and would like some help creating a Facebook page or enhancing your existing one. Today we celebrate National Get To Know Your Customers Day! Repeat and loyal customers are the success of your business. While you’re getting to know your customers, take advantage of the opportunity to show them they are appreciated. Make it a point to get to know a little more about your customers and make each of them feel important; check out the tips below for some ideas. New to the idea of incorporating video gaming in your establishment, but not sure how to get started? Already have video gaming, but wondering whether you’re getting the maximum benefit from your current terminal operator? IGS will be making its seventh showcase at the 2018 NRA Show at M cCormick Place in Chicago May 19-22. If you’re attending, be sure to visit our booth #5268 in the South Hall. We hope to see some familiar faces! For more information visit show.restaurant.org. Sting operations help hold businesses accountable when it comes to serving minors, however some lawmakers say the state is cracking down too hard when it comes to gambling. Like a growing number of restaurants and bars around Illinois, Don Carter Lanes in Rockford offers video gaming for customers over the age of 21. “These games have become such an important part of our business model now that we’re doing everything we can to keep minors out,” said Sommer. But Sommer says his best efforts might not be enough in an undercover sting. Under the law, sting operations can send in a minor to a bar or restaurant with video gaming. If the minor plays a machine before a waitress or manager can check their ID, lawmakers say that business could be fined up to $5,000. “By the time they can walk over there and tell the person they have to leave, they could have easily gotten one bet in and that was never the intent,” said Republican Senator Dave Syverson. That’s why Syverson is sponsoring a new bill to protect business owners from what he calls unfair practices. Two entrepreneurs are hoping to help breathe new life into East Dundee’s River Valley Shopping Plaza with their upscale video gambling cafe concept. T.J. Rubin and Jamie Arthurs recently opened Royals at 505 Dundee Ave., offering food, a variety of beverages, and several gaming machines.